Synopsis: Around midnight, under a lonely street lamp in a provincial town in Japan, lies a white woman, a blonde, alone, robbed of all four limbs, yet undead. Indeed, a rumor’s been circulating among the local girls that a vampire has come to their backwater, of all places. Koyomi Araragi, who prefers to avoid having friends because they’d lower his “intensity as a human,” is naturally skeptical. Yet it is to him that the bloodsucking demon, a concept “dated twice over,” beckons on the first day of spring break as he makes his way home with a fresh loot of morally compromising periodicals. Note: This prequel novel was the third volume of the Monogatari series released in Japan, following the two volumes that made up Bakemonogatari. Note: In Japan, Bakemonogatari was first released in two volumes. Later on, an edition was made that split the story in three volumes. For the English release, Bakemonogatari is three volumes. 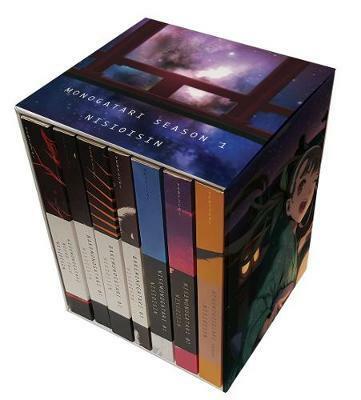 Contains the first seven volumes released in English by Vertical. Odd I hope we get more? Nothing has been officially stated about other volumes in the series yet. Vertical may be “testing the waters” with this release, to see if Monogatari LNs would be profitable or not. I imagine if Kizu does well, they would want to look into bringing more volumes over. Yes, so far, Bakemonogatari (all of it) has been confirmed, but nothing further than that. Nothing further than that has been confirmed, that is. Yay for more Nisio Isin! Thank God this is done by Vertical and not Yen Press.